We're not a typical law firm. We are a group of lawyers who realized a simple thing: if we took the time to share our most valuable asset with each other, the value of that asset would grow and grow. That asset is our legal skill. Anything we can do to increase that value will make each of us better attorneys and thereby provide better service to our clients. There is strength in our diversity. 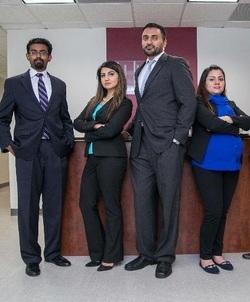 We are immigration attorneys, criminal defense attorneys, and seasoned civil litigators. We come from various backgrounds legally and personally, and take the time to benefit from that diversity. We are, in effect, a lawyer's study group. You have the right to understand the law we practice. So we explain it to you, in your language. Besides English, hablamos español, et nous parlons français, اور ہم اردو بولتے ہیں، 我们也讲中文，ونتكلم العربية, और हम हिन्दी भी बोलते हैं, 'ਤੇ ਅਸੀਂ ਪੰਜਾਬੀ ਵੀ ਬੋਲਦੇ ਹਨ, و ما در فارسی صحبت می کنند. To learn more about our team, click on the links to the right. If you have a specific question, feel free to consult us.